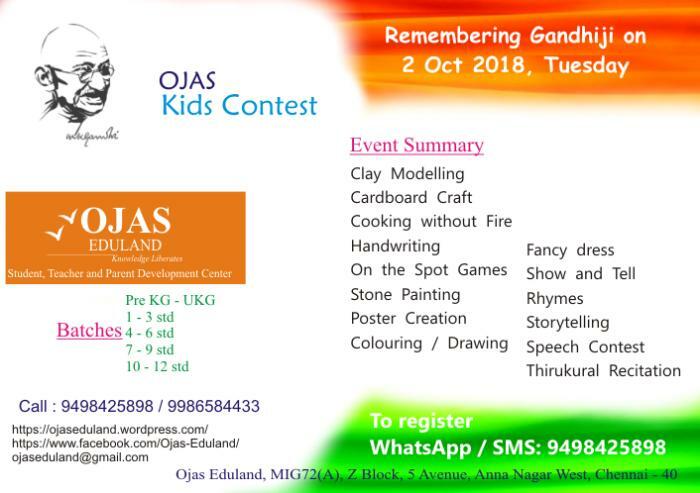 Age Group: 3 – 18 yrs (Pre.K.G to 12th std ). All the age group can participate in all the items. Participants have to bring the clay. A paper plate will be provided to the participants for display. Juices, Salads or any food can be prepared. Participants have to bring writing pad & Pen / Pencil. Simple on the spot games. Participants have to create the above said topic in picture from home. Printed pictures or stickers or drawings or any art material can be used for poster creation. Participants should use ONLY QUARTER size chart for creating posters. Finally kids have to explain what is displayed in the poster. 1st – 3rd students for colouring. Quarter size plain chart will be provided to 1st to 12th std students for drawing.